And the word is that this is just the first of KEIOC's ambitious wildlife based guerilla tactics to scupper the whole project! Anyway, the real story goes that water voles, a protected species, are thriving on the banks of Kirkby Brook...hardly the Royal Blue Mersey! The voles must be moved before any building work can be started and plans are already underway to relocate the rodents...hopefully the site they've got earmarked is Stanley Park! But the plot thickens as the voles must be moved by the autumn as this is when they begin their winter hibernation and, get this, it is illegal to disturb a sleeping vole...there's a sentence I never thought I'd see myself writing! So, should any of you outdoor types stumble across a slumbering vole on your ramblings then, for the love of God, don't go prodding it or whispering "You awake?" else you be clapped in irons quicker than you can say "I was checking for a pulse!" Tesco, not ones to be beaten to the punch, have already deployed a team of JCB's, seems a little heavy handed, and a group of wildlife experts, no word if Terry Nutkins is amongst them, to oversee the safe relocation of the little buggers! A spokesman for Knowsley council, which has backed the move, said: "As landowners, we have granted a licence for our land to be accessed in order for ecological works to be undertaken. 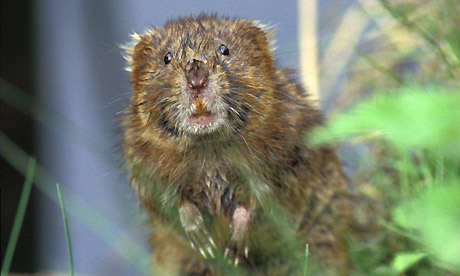 He added: "These works will ensure the safe translocation of a protected water vole habitat in Kirkby Brook. Furthermore: "The work will include the erection of safety hoardings, systematic clearing of overgrown vegetation and vole assessment." Vole assessment? Is there anyone that didn't piss themselves when they read that?! For more information on water voles you can check out the water vole conservation handbook...i swear I'm not making this up! "come any closer and I'll tell them I was asleep!"